NABU Lower Saxony offers a workshop on the topic of “Creation and maintenance of amphibian breeding ponds” within the LIFE Project floodplain amphibians. The workshop is organised in collaboration with the Lower Saxony group for field herpetology and ichthyofauna and the Environmental and Nature Protection Foundation Hondelage (Förderkreis Umwelt- und Naturschutz Hondelage e.V.). It is particularly for nature conservation volunteers. It will take place on Saturday 6th of July 2019 at the Nature Discovery Centre Hondelage (NaturErlebnisZentrum) Hondelage, postal address: In den Heistern 5c, 38108 Braunschweig. The one-day workshop will cover all important aspects of the creation of amphibian breeding ponds, particularly for endangered species. In addition to aspects such as size, depth and pod hydrologiy for each target species it will also answer questions on choosing the right size, required permissions and how to find the right civil engineering company. The workshop will also cover costs and possible funding sources as well as the need for long-term maintenance and conservation actions. To round up the day the event will have an excursion to various water bodies in the Brunswick area. Attendance of the workshop is free, but registration is required. The detailed program and a sign-up form will be published in due time on the webpage www.life-auenamphibien.com. 19,200 tiny fire-bellied toads will be released as part of the project. In 2018 about 2,600 toads were released. Spawn from both sides of the river Elbe were collected from various water bodies within the Biosphere Reserve River Elbe Valley Lower Saxony. The water bodies had a high water level and due to some already very warm days at the end of April, the toad had good and fairly numerous breeding places. The spawn was transferred to the Amphi International breeding station in the District of Lüchow-Dannenberg. Due to the warm summer, the tadpoles developed very fast and at the beginning of June the first already metamorphosed and were ready to inhabit their new habitat. The fire-bellied toad is comparatively frequent in the biosphere reserve, however also here a strong decline has been observed over the last years. For this reason, large areas have been developed for the benefit of the fire-bellied toad. Natural colonisation of these areas by the already locally present toads was not expected, as the existing populations only have a few individuals. In 2018 fire bellied toads were released in three places in the biosphere reserve. The populations from which the spawn is taken are also protected, because at least 10% of the removed eggs are brought back to the place of collection once fully metamorphosed. Such a high percentage does generally not survive in the wild. This method is used to stop the decline of the fire-bellied toad in the biosphere reserve and to reverse the trend of decline. In the Lower Saxony part of the river Elbe valley 10 new breeding ponds were created during the second construction phase. These new water bodies will serve the fire-bellied toad as a breeding pond and feeding habitat. In addition one ditch was redesigned and three new wintering habitats were created. The contract for the second construction phase in the area “Großer und Kleiner See“ in the parish of Neuhaus had already been awarded to a regional company in 2017. The creation of the water bodies however could not be delivered in the summer and autumn of 2017 due to prolonged rainfall. In 2018 the picture was completely different. The extreme drought enabled the start of the earthworks as well as a problem-free and fast delivery. There are now a total of 20 new and three restored ponds available to the fire-bellied toad in the new refuge area at the “Großer und Kleiner See”. The aim in this large-scale pasture area is to create an attractive habitat for this species. Until approximately 2007 the fire-bellied toad was native in the area of Strothe-Almsto,rf district of Uelzen. Despite conservation measures carried out back then the population, already reduced to a few individuals, did not recover. The bell ringing sound of the calling toads had disappeared from the landscape. Merely an interpretation panel reminds us of the past presence of these animals. In December 2018 and January 2019, 3 new ponds were created on sites in private ownership and on district council land as well as restoring two further ponds. The coverage with ponds is now so high, that a stable population can establish. Just add some toads. These will be brought into the area as part of the project. Spawn will be taken from other sites, bread until it reaches metamorphoses and then brought to the Uelzen area. You can read more about this in the section Actions/ Reintroductions. 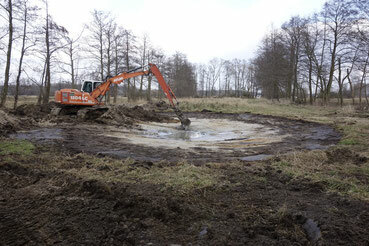 Tree frogs, great crested newts and moor frogs already present in this area will definitely benefit from the new ponds. Will the fire-bellied toad return? Various conservation actions are currently being delivered at two locations in the Dromling bog within the district of Gifhorn and the City of Wolfsburg by NABU Lower Saxony. The measures aim to improve the conditions for amphibians, in particular the fire-bellied toad. One site is located on the border with Saxony-Anhalt near the village of Kaiserwinkel. 6 new breeding ponds are currently being created here. ”There are individual records of fire-bellied toads from this area until very recently”, says NABU project manager Dr Markus Richter, “Our targeted search in the last 2 years however has not been successful”. Currently there are hardly any breeding ponds left, the new ponds are to attract any possibly remaining animals to breed here. In case that no toads can be recorded, then the reintroduction of this species is planned after liaison with all relevant partners and following the permit from the nature protection agency. A second area for conservation measures is located at the other end of the Dromling bog within the city of Wolfsburg near lake Aller. At this site several new ponds were created a few years ago. At the shore of the ponds however, there are dense woodlands and shrubs. These cast a shadow on the water body and therefore make the ponds unsuitable for the breeding of demanding amphibian species. ”Tree frog larvae only develop in water temperatures above 15OC. The water body ideally has to be exposed to the full solar radiation, so that the water can sufficiently warm up during spring”, explains Dr Richter. “A specialist company will therefore completely cut back the woody growth over the next days. ”However, willows, alders and birches will largely grow back from their stumps. To prevent the regrowth of trees, the site including the pond shores will be grazed in the future, grazing and trampling of the animals are intended to keep the shore open. To allow grazing, a fence will be erected from project funds. A local farmer has volunteered to have his animals graze the site. Using the site for the traditional Easter campfire will continue to be possible in the future. New breeding ponds for amphibians are currently being created in the floodplains of the rivers Oker and Schunter within the city of Brunswick. A total of 11 are to be created over the next weeks, the preparatory work for this is already in full flow. Individual sites for conservation measures were moved on request of Brunswick City Council, to prepare them for the search for undetonated bombs from World War II. Even after more than 70 years after the end of the war you have to expect undetonated bombs, munition and similar material in the soil in many places within the boundary of the city of Brunswick. These represent significant risks to any work involving diggers. NABU awarded a contract to a specialist company to search for and remove suspicious objects. Thankfully only nails, wire and other types of metal were found. The next step is to cut back woody vegetation at some existing ponds at Bevenroder Straße at Braunschweig-Querum. To keep the pond open in the long term, vegetation is cut back first and then the roots are removed with a digger. “Otherwise the woody vegetation would grow back and, in a few years, everything would look like before”, explains the NABU construction manager Joachim Neumann. “The sustainability of the conservation measures is a critical point of the overall Project”. The last step will be the creation of new ponds at the river Schunter near Querum along the river Oker in the area of Veltenhof. “The tender exercise is completed, the contract has been awarded, we hope that the currently dry conditions can be used for the earthworks with the digger”, explains NABU project manager Dr Markus Richter. “We are especially grateful to the city of Brunswick for their excellent cooperation. Without it, the delivery of this fairly complex conservation measure would not have been possible”. The City Council did not just provide nearly all of the sites but also contributed financially to the project. The granting of necessary permits preceded quickly and in an unbureaucratic way. ”We are very pleased that a local citizen was willing to provide his property for the creation of a new pond”, says Dr Richter. For next year, more pond creations in the area of the city of Brunswick are planned. Already in 2016 amphibian ponds along the river Schunter near the village of Hondelage were created as part of the LIFE floodplain amphibians project. The long-term goal is a continuous network of habitats for amphibians from Wendhausen in the East via the rivers Schunter and Oker all the way to Walle in the West. Particularly the currently isolated populations of the tree frog are due to be connected with each other, but also the great crested newt and further species will benefit from the conservation measures. Representatives of several LIFE projects from Lower Saxony and North Rhine-Westphalia met in Stadthagen for a network meeting. The newly started NABU Lower Saxony project “LIFE BOVAR” was the host. This project is dedicated to the protection of the yellow-bellied toad, midwife toad, natterjack toad and the great crested newt on 35 project sites in Lower Saxony, North Rhine-Westphalia and the Dutch province of Limburg. NABU welcomed guests from the project “LIFE Amphibian Network” of the biological station of the city region Aachen, the integrated LIFE project “Atlantic sand landscapes” with a representative from the Münster district administration, as well as from the already finished project “Protection of the common spadefoot” delivered by the NABU nature station Münsterland. Each project introduced itself and the focus of the event was knowledge exchange on the topic of the creation of breeding ponds for various species. In most cases an occasional drying out of the pond is desired. An important precondition for the successful creation of a pond is to establish the hydrological situation at each site. In quarries or on rocky slopes the artificial sealing of the pond with loam or concrete is required in many cases. During the afternoon various types of water bodies were visited as part of two excursions. The water bodies had been created as part of a yellow-bellied toad project funded by the Federal Agency for Nature Conservation. The first excursion took the 14 participants to the Liekwegen quarry. In this area, conservation actions for the yellow-bellied toad and the natterjack toad were delivered on an area of 22 hectares. Since the late 1990s the population of the yellow-bellied toad has grown from slightly more than 20 animals to over 1,000 individuals. “You can say that this is possibly one of the most successful amphibian conservation projects for the yellow-bellied toad in Germany”, said Bruno Scheel of NABU Lower Saxony with joy. This success is enabled by management in the form of year-round grazing by three wild horses. In addition to the yellow-bellied toad many other species benefit from the conservation measures at Liekwegen quarry. In addition to the yellow-bellied toads the participants of the excursion could also see tadpoles and young juveniles of the natterjack toad as well as native newt species such as the palmate newt, lizards and a fully-grown slowworm. The second excursion visited two sites owned by NABU near the village of Raden in the district of Schaumburg. At this site, ponds were created as stepping stones for the yellow-bellied toad. The particular feature of these water bodies is that the bottom of the ponds was covered with a special material called Dernoton. This helps to keep water on site. At the end of the excursion the participants were in for a surprise. At the last pond they visited, the first ever record for a yellow-bellied toad had just been made. ”Two and a half years ago about 2.5 km away from here we introduced the yellow-bellied toad. It is highly likely, that the animals at this site come from there. This highlights the success of the re-introduction measures”, stated Christian Höppner, NABU project manager of the LIFE project BOVAR. As part of the LIFE project floodplain amphibians, NABU Lower Saxony is currently creating six new breeding ponds for rare amphibians at the edge of the nature conservation area Ilker Bruch within the city of Wolfsburg. They will primarily serve the tree frog as breeding ponds. This rare amphibian has its most important occurrence in the catchment of the river Aller at the Ilker Bruch and the surrounding areas. This population needs safeguarding and strengthening, explains project leader Dr. Markus Richter from NABU Lower Saxony. The local branch of NABU Wolfsburg and the City of Wolfsburg have provided these areas for the conservation action. A further aim of this activity is the creation of a suitable habitat for the fire-bellied toad. “Together with other water bodies, which we want to create in the autumn of this year, they should create the conditions for a reintroduction” explains Dr. Richter. 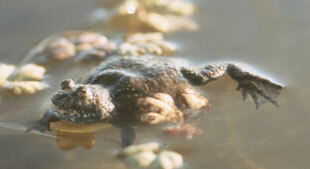 The fire-bellied toad used to have numerous occurrences along the river Aller, but has been extinct for a few decades. The area Ilker Bruch and its surroundings offer ideal conditions for the reintroduction, if a sufficient number of new ponds is created. A decision about the actual reintroduction will only be made once it is established, that the water bodies meet the needs of the species, explains Richter further. NABU operations manager Joachim Neumann had to deal with much more practical questions. A specialised company from the region had already been commissioned in late summer to do the earthwork. The ongoing higher levels of rainfall during the whole of the second half of the year made the execution of the work impossible. Again and again the start of the earthworks had to be rescheduled. “The dry weather of the recent days caused the water levels to drop, so that an attempt to deliver the work was undertaken.” Up to now everything is going well. I think we’ll manage” says Neumann with confidence. In at least three project areas the digger was supposed to come in this autumn to create new ponds for the fire-bellied toad and the tree frog. But the unusually high levels of rain of the last months enforced inactivity. Already in May, various areas had a large proportion of the surface under water. The strong rainfalls had turned the meadows into water bodies. Further rainfall did not allow the areas to dry out over the summer. In Lüchow, in the floodplain of the river Elbe, the highest amount of rainfall for 35 years has been recorded for June. The areas earmarked for action are currently so soaked, that the required removal of soil is impossible. It is currently unclear, if this activity can be carried out at all this year. Within the context of the NABU project LIFE floodplain amphibians the first 889 reared fire-bellied toads could be released in the project area Lower Saxony River Elbe Valley. The release happened in the area Grosser/ Kleiner See in the parish of Am Neuhaus, Luneburg district. 10 breeding ponds were created here last year for the fire-bellied toad and three existing ponds were restored. At least twenty further ponds are to follow. In addition, an extensive grazing programme for the water bodies and the surrounding area is being established, the water level of the grasslands is being raised. This will create a large-scale and highly suitable habitat for fire-bellied toads in the coming years. The project team anticipates that one of the strongest populations of the fire-bellied toad in Lower Saxony will establish at this site. As there are hardly any fire-bellied toads present in the area Grosser/ Kleiner See, it was necessary to enhance the existing population with bred animals. The breeding of the fire-bellied toads was undertaken by Amphi International at the breeding station at Neu Darchau. There are plans to release toads bred in this way for a further two years. After that the population should be sufficiently strengthened to be self-sustaining and able to grow. The administration for the Biosphere Reserve Lower Saxony River Elbe Valley are also involved in this project as a partner. Within the project, further releases are planned along the river Elbe as well as in the catchment of the river Aller. 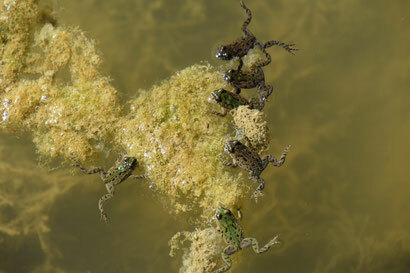 The aim is to restore the original distribution area of the fire-bellied toad in Lower Saxony. In the Elbe valley in the area of the parish of Amt Neuhaus the first fencing work started at the beginning of March. Approximately 4 km (2.5 miles) of fence enable the fencing off of 46 hectares of grassland. This allows the transition from mowing and aftermath grazing to a permanent extensive grazing regime. At the end of 2017, the creation of new ponds for the fire-bellied toad will follow on these fenced-off areas. By establishing an extensive grazing regime the banks of the water bodies are due to improve their habitat conditions, e.g. keeping the banks free of willows. Preparations started towards the end of the summer to select sites for the reintroduction of the fire-bellied toad. For the area NABU 6 several sites are planned for the reintroduction. Currently it is investigated, where exactly the best conditions for a permanent establishment of the fire-bellied toad are. Many site visits were conducted and maps and aerial photography were analysed. For the reintroduction to be successful, all required components of the habitat need to be present (or have to be created). The lack of sufficient water dynamics along the river Aller is a problem. Following the management of the River Aller with weirs and barrages, the water levels of the river and in the floodplain are currently fairly constant. The fire-bellied toad needs a high level of water dynamics with flooding in spring and shallow waters drying out in late summer. These conditions only exist in a few places. The situation along the river Oker within the boundaries of the City of Brunswig is more favourable. The floodplain is regularly flooded. It is expected that it is possible to create breeding ponds with sufficient water dynamics. The decision on the implementation of the reintroduction is made not before the newly created ponds prove to be suitable. 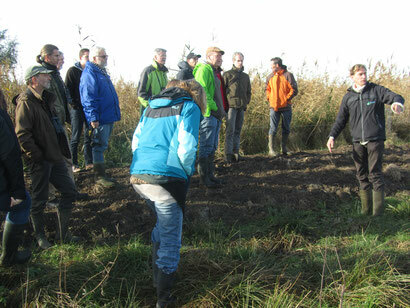 The working group of the LIFE project Floodplain Amphibians met in Neu Darchau at the River Elbe. The first new ponds created for the fire-bellied toad were visited. 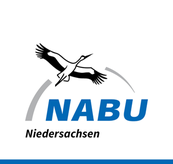 The working group, consisting of relevant District Councils, representatives of the federal Lower Saxony Agency for Hydrology, Coastal and Nature Protection, local groups of NABU and other nature conservation organisations and amphibian experts meets regularly. This ensures an extensive knowledge exchange within the project and that all measures are carried out at a high quality technical level. This time the meeting took place in Neu Darchau within the area of the Biosphere Reserve River Elbe in Lower Saxony. Project lead Dr Markus Richter (NABU Lower Saxony), Rebecca Heiligtag (Biosphere Reserve Administration) and Ute Thiergärtner as well as Florian Bibelriether (Amphi International ApS) presented the latest state of play of the project. After that, the working group visited the first creation measures for the fire-bellied toads on site. Within the area of “Großer und Kleiner See” (Large and Small Lake) in the Parish of Neuhaus the project has created ten new ponds and restored three existing ones. The German-Polish conference “Amphibians and Reptiles – distribution, protection and perspectives on development”, will take place on 22 September 2017 at the Brandenburg Academy, at Criewen Castle at the river Oder. The project LIFE floodplain amphibians is represented. Florian Bibelriether from Amphi International, who delivers the project together with NABU Lower Saxony and the Biosphere Reserve administration for the Lower Saxony River Elbe Valley, will present the protection measures for the fire-bellied toad, the tree frog and the great crested newt under the title “Protecting amphibians in the north east of Lower Saxony”. The Brandenburg Academy in cooperation with BUND Brandenburg is the conference organiser. Speakers from Germany and Poland will present and discuss measures necessary for the protection of amphibians and reptiles in Germany and Poland as well as taking stock of the current situation in various areas. The investigation into the genetics of the Lower Saxony fire-bellied toad has started. Project partner Amphi International ApS took samples from over 100 toads in spring and summer, predominantly from the floodplains of the River Elbe within the parish of Neuhaus. Analysis of the samples will be done by the working group of Prof. Dr. Tiedemann from the Institute for Biochemistry and Biology at Potsdam University. This working group has substantial experience in the genetics of the fire-bellied toad in northern Germany. This investigation will determine which populations of fire-bellied toads are most suitable for the planned reintroductions to other locations. The use of individuals for reintroductions which are not genetically native to the area has to be avoided. On the other side, a high genetic diversity is helpful for the long-term survival of the new populations to be established. More samples from the river Elbe floodplain will be taken next spring. This means final results will be available in 2017. A small population of tree frogs lives along the river Schunter, a small river within the City of Brunswig. 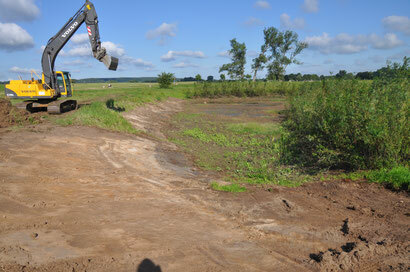 Several new ponds had been created along the river as part of a large-scale restoration project. However, the tree frog has only populated a small number of these ponds. Measures as part of the LIFE Floodplain Amphibians project are now going to help the tree frogs. Several ponds -nearly completely overgrown by trees and shrubs - have been cleared. This will let more sunshine through to the water surface. Tree frog tadpoles only develop successfully in warm water. The bottom level of several ponds was raised. These ponds had so far been filled with water permanently. During flooding events fish entered the ponds and prevented the reproduction of the tree frog. The redesigned ponds should now regularly dry out in the summer. This will prevent the permanent presence of fish and other predators feeding on tree frog spawn and tadpoles. Several shallow ponds, which previously dried out too early, were deepened. Finally, two new ponds were created. In total there are now 14 ponds with suitable conditions for tree frog reproduction. The measures were conducted in close collaboration and active support from the local nature conservation group FUN in the Brunswig suburb of Hondelage. FUN established grazing by cattle and water buffalos on meadows along the river Schunter. These will now manage the ponds and ensure that they will not overgrow again. The first practical measures as part of the LIFE Floodplain Amphibians project have started by commissioning a local building company with the works. 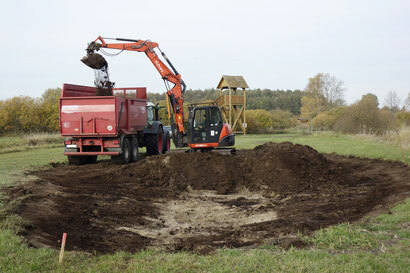 This will shortly create 10 new breeding ponds and restore three existing ponds for fire-bellied toads in the River Elbe floodplain in the parish of Neuhaus. One further larger pond will be redesigned to meet the requirements of the fire-bellied toad. The ponds will serve as feeding and breeding habitats. In addition, smaller and larger ditches in the surrounding area will be blocked. This will re-wet the whole area. Shallow floodings will form in spring that will warm up quickly. This is a preferred habitat for fire-bellied toads migrating from their overwintering habitats.